Hip height gardening seems to be a where I’m gravitating to lately, and I really like the above planter with the trellis. We could save some money, and customize one for ourselves, and here’s a video from Lowes Home Improvement for some inspiration. I could always add in my own trellis with possibly a wooden lattice or pig wire, Hmmmmm, the creative juices are flowing. I love that you can roll this planter to wherever you need it, because sometimes your plants may or may not need as much sun. It’s definitely a thumbs up for us back sufferers too. This is my #1 tip when it comes to gardening and physical ailments. Get a high quality expandable hose that easy to lift and move around, trust me your back will love you for it. Plus, it shrinks right back up when your done with it, which means it’s easy to put back up. LOVE this hose. So, there you go, these are the ideas I am looking forward to either trying or buying this spring, and If any of you out there are having a hard time with body aches and pains, I hope that you get well soon. Happy Gardening Everyone! When I first bought my home over 10 years ago, the last thing I thought about was putting a garden in the back yard. In fact, the majority of my yard is a huge concrete patio, which at the time was great, because it meant less grass to cut! 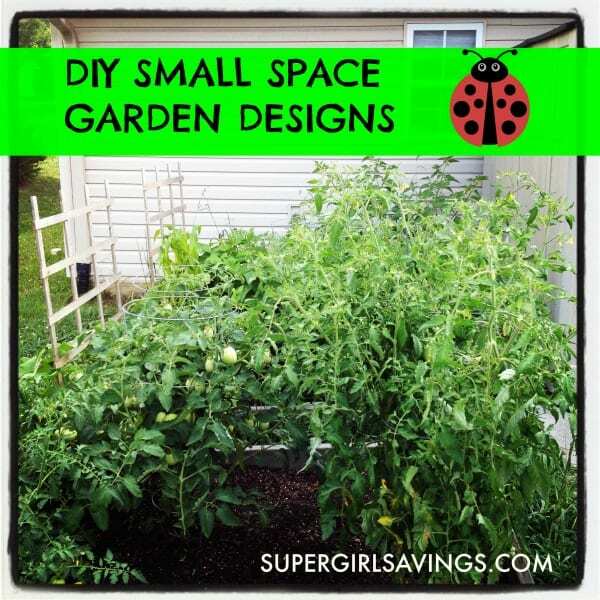 🙂 But, over the years, the gardening bug had gotten a hold of me, and with the help of my hubby, I found some super DIY small space garden design ideas, that have brought a fully functional garden into my backyard. Below is a timeline of my garden design ideas, which I hope will inspire some of you to also become a fellow green thumb and make “growing your own” a part of your lifestyle. Gardening has helped my family and I afford fresh produce, which not only tastes the best, but is a great way to stay healthy for less. My very first year of gardening, I bought some huge planters and grew some tomatoes, green peppers, and herbs. Seriously, it couldn’t get any easier, but I wanted to grow more, so that I could can my garden goodies for the winter months. So, the following year my hubby and I took advantage of some flat area space right behind my house, and we built three raised bed gardens. We also added some wooden trellises to the ends of our raised garden beds, which allowed us to grow vertically and add more veggies such as beans, cucumbers, and squash. 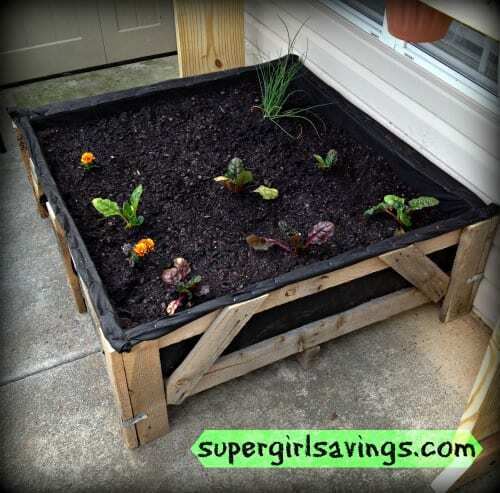 Below, are some ways that we found ways to grow veggies and herbs on our patio. First up, is our pallet beds. And finally, I wanted a way to walk right outside by back door and add fresh oregano, basil, mint, cilantro, or dill to my daily meals. So, we built a DIY Herb Planter. New FREE Garden Design Class! I just took a new, FREE online mini-class called, “Transform Your Garden Design” from Craftsy. I’m not going to tell you all the super ideas that Rebecca Sweet shares, but if you feel like you need some guidance in taking your garden design to the next level this class is for you. So, sign up now and check out what other FREE mini-classes are available, including stamping, woodworking, and crocheting to name just a few. Just so ya know that some of the links above are my referral links, which means I may get a small commission if you make a purchase, at no additional cost to you of course. Thank you for your support!! SuperGirlSavings is a participant in the Amazon Services LLC Associates Program, an affiliate advertising program designed to provide a means for sites to earn advertising fees by advertising and linking to Amazon.com.